The project, in an innovative manner acceptable to children, develops the consciousness of the importance of adopting a healthy life style, and using free time for quality content, through developing long term interest for doing sports. The project motivates, educates and helps students to choose their sport and thereby get involved in sports and recreational activities. Aiming to create conditions for equal representation in sport activities, the project enables children in adverse situations and therefore at risk of social exclusion free training and sport equipment in the clubs belonging to the Zagreb Judo Union. The project fosters the cooperation between educational and sports institutions, turning in parallel to parents as well, thus creating the influence stating doing sports is something that is generally acceptable and customary. Following the education through an extra-curricular lecture “Kid Athletes” and motivation by children’s play “Olympic Tales,” the children in grades 1 through 4 of 12 primary schools from four municipalities in the area of the City of Zagreb will be invited to get involved in the trainings of the “Mini Judo School,” that will be implemented in the duration of 10 months in sports halls of the judo clubs of the Zagreb Judo Union. Aiming at creating the conditions for equal representation in doing sports, children in adverse situations and thereby at risk of social exclusion – who chose judo within the implementation of the programme “Choose Sport” as their sport – will be enabled free training in the “Mini Judo School” of the Zagreb Judo Union, and will get the sports gear – a judo kimono for the training. to better the capacities of the trainers, sport instructors and activity leaders, for the work with children in target groups. The extra-curricular lecture “Kid Athletes” is targeted at the general population of pupils of 12 primary schools from four municipalities in the area of the City of Zagreb. Storytelling is a traditional way of communicating with children. In 12 primary schools, for pupils in grades 1 through 4, children’s plays will be performed, in the duration of 60 minutes, about famous athletes and their growing up through the prism of sport. The project and its goals fully address EU, national and regional strategic documents in the area of social inclusion. Direct connection of activities is visible at the level of EU in the DIRECTIVE (EU) no. 1304/2013 of the EUROPEAN PARLIAMENT AND COUNCIL dated 17 December 2013, in the section dealing with the European Social Fund. The Directive states the ESF should promote social inclusion. It is pointed out the availability of accessible, sustainable and quality services of general interest should be taken into account, especially in the area of health care, employment and training in connection with child care, and it is further stated the providers can be social companies and non-governmental organizations. 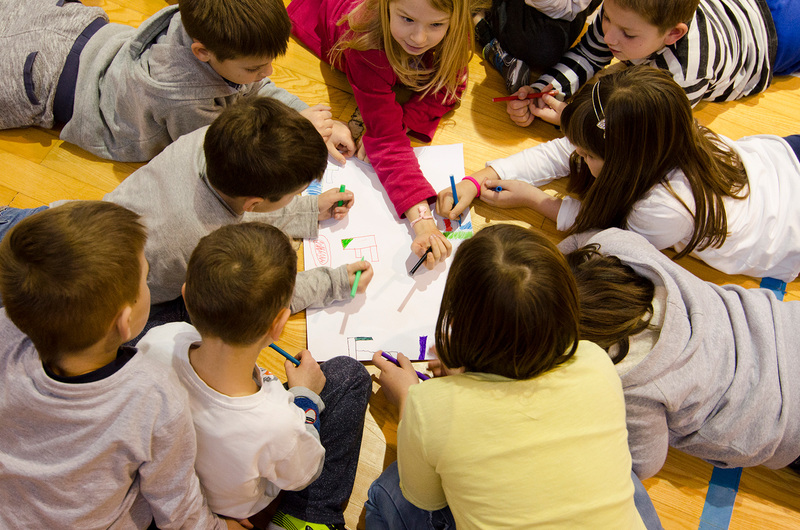 At the national and regional level, the connectivity is visible through: the NATIONAL STRATEGY FOR THE RIGHTS OF CHILDREN IN THE REPUBLIC OF CROATIA FOR THE PERIOD BETWEEN 2014 AND 2020. The connectivity is visible through the strategy of continuous development of all-encompassing, well adjusted, quality and available social services and support for social programmes and social policies. Furthermore, there is a clear connection with priority areas: 1, 2 and 3, through continuous development and advancement of systems of well adjusted, quality and available and timely social services for children and families that are beneficiaries of the system of social care (all project activities). The project contributes to the realisation of charted goals from the STRATEGY FOR COMBATING SOCIAL EXCLUSION IN THE REPUBLIC OF CROATIA (2014- 2020), because children in the light of their family structure bear a higher risk of social exclusion and greater issues with social exclusion, so, therefore, the interruption of the cycle of the transfer of fewer opportunities at early ages. The applicant have, since 2010, implemented programmes of universal prevention through the popularisation of physical activity aiming at general health and the prevention of negative sociological behaviour, this supported by: the Office for Combating Drug Abuse, the Ministry of Health, the Ministry of Science, Education and Sport, the International Olympic Committee and the Croatian Olympic Committee – the above taking place in primary schools in the City of Dubrovnik, the Town of Samobor and the City of Zagreb. Representatives of the Association, in 2013, cooperate with the Croatian Institute for Public Health, introducing the programme of Health Education, within the module Healthy Living of the Ministry of Science, Education and Sport. 1979 – 1995; active athlete, national team member (multiple champion of the Republic of Croatia and a member of the Croatian national judo team; in 2000, the coach of the Croatian national judo team). 1989 – graduated from the Zagreb Faculty of Physical Education. 2008 – published a series of children’s books “Kid Athletes 1 – 5,” supported by the Ministry of Culture, the Croatian Olympic Committee and the International Olympic Committee. 2009 – 2011 – author and leader of the preventive programme “Choose Sport;” including pupils in extra-curricular sports activities. 2013 – author of the project “Olympic Tales;” children’s books – picture books targeted at pre-school and school age pupils. reporting on the realisation and financing of the programme. participation in additional trainings abroad. The partner, the Zagreb Judo Union, is of great significance for the project, because they possess great experience and ensure the implementation of the project in 12 primary schools in the area of the City of Zagreb. The partner is also important on account of the coordination of activities of inter-disciplinary cooperation and increasing awareness on the importance of sports activities. The project “Choose Sport” was presented at the international conference of the World Health Organization, within the programme “Healthy European Cities, in Liege, Belgium, in 2011, and in 2012, as an example of best practice within the “Week of Prevention,” held in Zagreb, and organized by the Ministry of Health, and at the “Professional conference for heads of primary schools in the Republic of Croatia,” in Pula. Moreover, in 2014, the project received the support from the International Olympic Committee, and was, in 2014-2015, implemented in primary schools of the City of Rijeka, where it exhibited exceptionally good results in motivating children’s inclusion into sport. In 2015, the project was presented at the 8th Meeting on the WHO European Childhood Obesity Surveillance Initiative in Dubrovnik. The series of books “Kid Athletes” – as one segment of the programme “Choose Sport:” the series of books “Kid Athletes“ was published in 2008 and was supported by the International Olympic Committee(IOC) and the Croatian Olympic Committee (HOO), which provided proof “Kid Athletes” meet the highest standards of expertise in sports literature. Since 2011, the books have been an auxiliary teaching aid for the subject Physical and Health Culture in grades 1 through 4 of primary schools. The project “Olympic Tales” was implemented in the school year 2014-2015, supported by the Ministry of Health in primary schools of the City of Zagreb and the County of Primorsko – goranska. The project, in an innovative manner acceptable to children, develops the consciousness on the importance of adopting healthy life style, and using free time for quality content, through developing long term interest for doing sports. Aiming at creating equal distribution in doing sports, children in adverse situations and who therefore are at risk from social exclusion, are enabled free trainings by the project, as well as free sports gear in the clubs of the Zagreb Judo Union. The project further fosters cooperation between educational and sports institutions. 1.Aiming at creation of equal distribution in doing sports, children who are in adverse situations and thereby at risk from social exclusion, are enabled free trainings by the project, as well as provided sports gear in the clubs of the Zagreb Judo Union. The project fosters cooperation between educational and sports institutions, in parallel addressing the parents, creating the impact in the environment that doing sports is something that is generally accepted and customary. EXPECTED RESULTS are the inclusion of 50 participants from the target groups and educated trainers, sports instructors and leaders of activities for long term viability of the programme and 3 activities for fostering awareness. The content of the webpage is the exclusive responsibility of the association Pokret – aktivan i zdrav (Movement – active and healthy), an association for the promotion of physical activity. The creation of the webpage was co-financed by EU from the European Social Fund.